Born in Kobe prefecture, Japan in 1949. 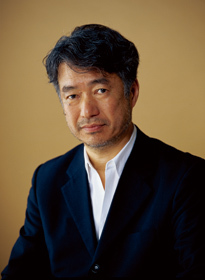 In 1991, he established Tamotsu Yagi Design in San Francisco. His design works are performed globally. Every year, no less the a hundred of his design works are selected for the permanent design collection of the San Francisco Museum of Modern Art. His bottle design for TRIBU perfume by Benetton Italy Co.,Ltd. has received the CLIO AWARD in 1994. In 1995, Yagi had his private exhibition in six months at the opening of SFMOMA. (SFMOMA moved on January that year.) In April, the American Government gave him a prize, which is for an Asian contributor in the artistic field. Yagi often collaborates with architects. He consulted for the graphic design of the museum of Foundation Beyeler (architecture by Renzo Piano; a famous art director), and the concept design for the Apple Store. (Apple Computer Inc.) The sign system and the environmental display plannning for Hiroshima Naka Factory (a new ecological garbage incinerating facility promoted by Hiroshima city / architecture by Yoshio Taniguchi), which opened in 2003, is his latest project.